Billions of dollars in sales. Quick shipments. Click here for the article on FastCompany. “Nanati brathuku natakam” is a beautiful Annamacharya keerthina, popularized by the great singer M.S.Subbalakshmi through her out-of-the world rendition in Revathi raga. In this keerthana, Annamacharya laments about human existence, its various obstacles in attaining Moksha and says “tegadhu paapamu teeradhu punyamu”. It loosely translates to the parallel tracks of good and bad acts performed by humans and the inescapable/non-nullifiable consequences of such acts. ‘The Apostle’ is such a story where a Christian preacher struggles to exorcise his bad past even while he constructs a life of good deeds. A detailed synposis is available here on RottenTomatoes. I saw this movie in 1988/1999 on home-video and Robert Duvall’s performance has stayed with me since then. For many he is the quintessential background guy (Tom Hagen in ‘The Godfather” or ‘Boo Radley” in “The Mocking Bird”) who delivers a subdued performance but never in the league of a ‘staring in the face’ kind. ‘The Apostle’ proves this notion wrong. Robert Duvall is outstanding as the tormented preacher, who is mindful of his own sermon– ‘His judgement cometh and that right soon’. It is his performance that makes the film a must watch for anyone and more so for any actor who wishes to explore realms beyond his comfort zone. 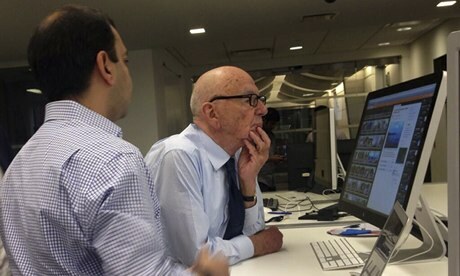 “Storyful has become the village square for valuable video, using journalistic sensibility, integrity and creativity to find, authenticate and commercialise user-generated content,” said Robert Thomson, News Corp chief executive. “Through this acquisition, we can extend the village square across borders, languages and platforms.